With 2017 fast approaching in this neck of the woods, it’s time for my annual year-in-review post. I usually don’t have too many complaints in these posts, but I have to say 2016 really tested me. And it wasn’t just election-related! It started with some health issues that began late last year, persisting into early summer. I had a bunch of doctor’s visits and several expensive tests, but there was no real insight into what was going on. Things improved in the second half of the year, thankfully. I still don’t have any idea what was going on, but I’m making an effort to get more rest these days. Work continues to be a major source of stress, unfortunately. My writing goals for the year were pretty much a bust. I submitted way more stories this year, but didn’t write much new fiction. As with last year, the bulk of my spare time was occupied by working on apps. I released a new PC app, two new Mac apps, a new iOS app, and 33 app updates. In February I self-published my short story, That Which Dwells Beneath, in eBook and paperback form. This story first appeared in Lovecraft eZine in 2014. That was a fun learning exercise, even though it didn’t sell much. My plan was to use the knowledge gained when launching my first novel. Incidentally, I didn’t work on the novel, other than to re-read parts of my 2011 NaNoWriMo effort. I entered two flash fiction competitions during the year, this time for Escape Pod and Cast of Wonders. My Escape Pod entry made it past the first round, but not the second. It probably didn’t help that I wrote both at the last minute! I read more writing books this year and took two classic Dean Wesley Smith writing workshops related to genre and writing in series. I also signed up for Mark Dawson’s Facebook Ads for Authors course when it was offered this past summer, as well as his new Self Publishing 101 course. All of the above were well worth it, though it’ll take awhile longer to get the full benefit from the FB Ads course. I continued listening to some great short fiction podcasts on my daily commute, including Escape Pod, Pseudopod, PodCastle, and Cast of Wonders. I highly recommend them, even to people who might not be short fiction readers. The podcasts are free, but please donate or subscribe if you enjoy listening. As previously mentioned, I did a tonne of work on my apps this year. I released 4 new apps and more updates than last year. My iOS, Mac and PC apps continue to decline in sales, despite the release of new apps. Revenue is slightly lower than last year. My new apps tanked badly, but I’m hoping they’ll do better by next Spring, since gardening app sales are typically seasonal. In mid-April I released a Mac version of my orchid collection tracking app, Orchid Album. Like the iOS and PC versions, this app is localized into 6 languages, including English, French, Italian, German, Spanish, and Portuguese. October saw the release of both Mac and PC versions of my iOS cactus collection tracking app, Cactus Album. This year I’d localized the iOS app into an additional 6 languages (French, Italian, German, Spanish, Portuguese, and Thai), and likewise for the Mac and PC versions. In December I beat the App Store shutdown deadline and released my first new iOS app in two years, Plant Album. This is a more general-purpose garden and plant tracking app for gardeners, localized into 6 languages, including English, French, Italian, German, Spanish, and Portuguese. Despite adding a few more Android test devices to my collection this year, I didn’t do much work on Bonsai Album for Android. I’m getting stuck into learning the platform from scratch (again!) and hope to complete the app in 2017. I’ve abandoned the untitled shoot-em-up game I was working on late last year. It would’ve been too much effort and expense to bother with considering the totally flooded game market these days. It’s a pity, since I had a prototype working on iOS, Mac, and Apple TV with the same codebase, including game controller support on all three platforms. My interest in bonsai this year was confined to keeping my trees alive. I didn’t attend any bonsai shows or botanic gardens this year. I also lost a handful more trees, due to the harsh winter and a squirrel (or was it a rabbit or raccoon?) chomping apart one of my tropical trees at the roots. Travel-wise, this year we made a bunch of trips to Michigan as usual. We also visited Amish country in Indiana, and the Cedar Point amusement park in Ohio. No exotic Florida vacation this year! I wasn’t terribly happy with my personal fitness in 2016. Between the aforementioned health issues and slacking off in the final few months of the year, I didn’t exercise anywhere near as much as I should have. This year I voted as a U.S. citizen for the first time, voting in the Illinois primaries and the general election. I wasn’t happy with the result of either one, but at least I voted, unlike most of the population! – Write more fiction and complete my first novel. – Complete my first Android app (most likely Bonsai Album). I still need to finish off the iOS, Mac and PC updates for Bonsai Album I’ve been working on since Summer, but after that the decks should be clear to get cracking on Android. – Get back into my usual exercise routine, at least 3 times per week. – Spend more time in our garden. I worked on the veggie garden this year, but just about everything else was neglected. It has been depressing looking at some amazing photos of our garden from the past decade and realizing it hasn’t looked that great in many years. I hope everyone had a decent year, and I wish you well as we head into 2017. Happy New Year! 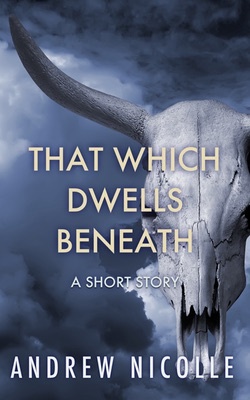 My third author-published short story, That Which Dwells Beneath, is now available on Amazon, iBooks, Kobo, Nook and via direct sale. That Which Dwells Beneath was first published in Lovecraft eZine, December 2014 (Issue #33). I hope you enjoy the story, and look for more soon! With the start of a new year, it’s a good time for one last look back at the previous year. I don’t have too many complaints about 2015. The day job was a madhouse for much of the year, involving stacks of overtime and some overseas travel. Both of our old cars continue to test the pocketbook, and finances will prevent their replacement anytime soon. On the bright side, I finally paid off my large medical bill, so that’s one less thing to worry about. Revisiting my 2015 goals, I wasn’t able to focus on writing so much. I didn’t go back to my novel at all, though I wrote a bunch of short stories instead. I mostly expended a huge amount of effort on my apps. In addition to 20+ iOS app updates, I released 3 new PC apps and an Apple TV app. During 2015 I wrote a new Lovecraftian story and a whole bunch of flash fiction. From the latter I selected the two best stories to enter the Pseudopod flash fiction competition. One of the two stories made it past the first round, but was knocked out in the second. It was loads of fun to create some glimpses of new worlds and characters, so it’s something I’d like to do more of in the future. Last year I read several writing books and watched some James Patterson Master Class writing lectures, as well as another lecture by Dean Wesley Smith and the folks at WMG Publishing. While there were no mind-blowing revelations, there were plenty of cool things to add to my writing toolbox. My experiments in self-publishing fell flat, leaving me to conclude that short stories are a very tough sell at the present time. Then again, I can’t discount the possibility that my stories really sucked! I had one story enrolled in Kindle Unlimited (KU) for 3 months, but had zero borrows over that time. If you’re a reader signed up for a Kindle Unlimited subscription, you would’ve been able to read it for free (i.e. borrow). The economics of the program changed during the year, which means it’s no longer possible to earn substantially more per short story download from a KU borrow vs a direct purchase at 99 cents. What was odd was making a handful of sales after pulling that particular story from KU. While sales at Amazon were bad, everywhere else was completely dismal (zero!). As a result, I have since made both stories permanently free on all eBook platforms. I’m now getting a steady trickle of downloads, but still only on Amazon. I did okay with keeping my stories out for submission at traditional markets, but like always, could’ve done better. I continued to listen to short fiction podcasts on my daily commute via Escape Pod, Pseudopod, and PodCastle. I highly recommend them, even to people who might not be short fiction readers. The podcasts are free, but please send a few bucks their way if you enjoy listening. As mentioned above, I did a huge amount of work on my apps in 2015. I released 4 new apps and even more updates than last year. My iOS and Mac apps continued their steady sales decline, with most almost reaching saturation point for their respective niches. Revenue for my iOS and Mac apps is roughly flat compared with the previous year. My PC apps didn’t do as well as expected, but they still helped minimize the impact of the lower sales of the rest. Near the end of March I released Bonsai Album for PC. 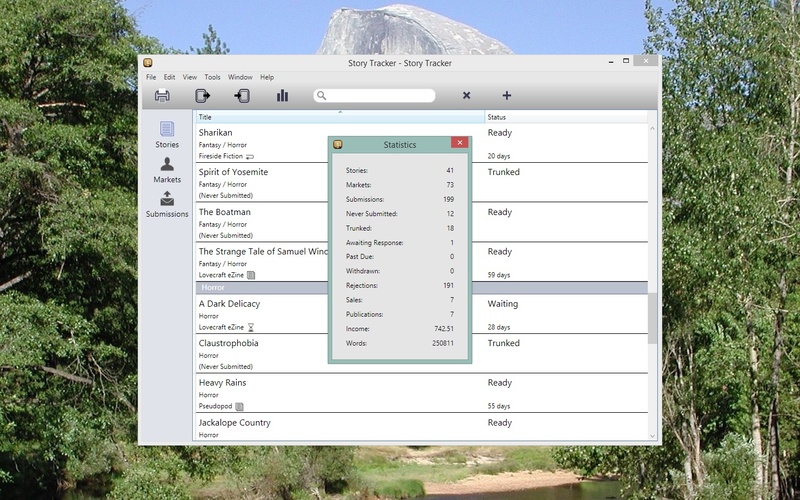 This is the PC version of my Mac bonsai tracking app, and it contains pretty much the same features. Like the Mac version, this app is localized into 7 languages, including English, French, Italian, German, Spanish, Japanese, and Portuguese. 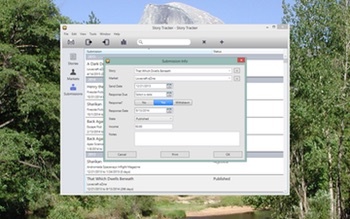 There were some particular challenges on the PC platform with respect to obtaining a code-signing certificate and getting the licensing code working, but I was able to reuse this work in my other PC apps. In mid-May I released the PC version of my submission tracking app for writers, Story Tracker. In July I announced Bonsai Album for Android, taking my first tentative steps into Android app development. September saw the release of the PC version of my iOS orchid collection tracking app, Orchid Album. Like the iOS version, this app is localized into 6 languages, including English, French, Italian, German, Spanish, and Portuguese. In October I released an Apple TV version of my flying jackalope game, Flapalope. This was a fun exercise, since Apple TV apps are quite similar to iOS apps. I’m using the Cocos2D game development framework again. I also had fun creating a game trailer on YouTube. A single 99c purchase unlocks both the iOS and Apple TV versions. Unfortunately the Apple TV App Store launch was botched in the first few weeks, leading to most apps being difficult to find. The situation has only marginally improved since. Despite having made a grand total of 63 cents from this new game, I was excited to work on another one. This time around it’s an untitled shoot-em-up, also done with Cocos2D. The prototype is already working on iOS, Mac, and Apple TV with the same codebase, and also has game controller support on all three platforms. I’m still trying to decide which direction I’ll take the game, but I’m hoping to release it sometime this year. Another big milestone this year was finally obtaining my U.S. citizenship! I’ve been eligible to apply for years, but with the looming 10-year expiry and renewal of my greencard, it was time to do some serious thinking. I applied in January, studied furiously for the test, and the interview and subsequent ceremony was in May. My interest in bonsai waned further in 2015. I lost a few more trees during the horrendous winter, which added to the tally from the previous winter. There were no new trees this year, either. I attended one bonsai show at Morton Arboretum, but missed the big show at the Chicago Botanic Garden due to travel. I didn’t take much time off in the first half of the year, but enjoyed having my parents visit during Summer. We spent some time with them in Milwaukee and upper Michigan before they headed to the next stop on their trip. Later, we went camping with the inlaws, and in December we headed to Florida for Christmas, visiting Daytona Beach, Saint Augustine, Epcot, Key West, and Legoland (including the new Legoland hotel). I also had two week-long business trips in 2015, spending some time in Paris and Guadalajara. Alas, not as fun as they might sound. I was fairly happy with my personal fitness in 2015. I made time for regular treadmill workouts, consistently exercising 3 times a week, except for travel weeks and when the treadmill died in February. Funnily enough, the treadmill died a week before its 10-year warranty expired, so we only had to pay for the labor cost of repairs. – Number one goal this year is to complete my first novel. I’ve always wanted to have at least one under my belt before hitting 40, and time is fast running out! – Further to the previous goal, I plan to focus on my writing this year, rather than sacrificing it for apps. This includes both writing more stories and substantially ramping up submissions. – I plan to continue my usual exercise routine. It gets tougher with age, but the benefits are too great to pass up. – I’d like to release my new shoot-em-up game on iOS, Mac, and Apple TV. I’ve spent a bunch of time on the prototype, and I’d hate for all that effort to go to waste. So, that’s it for another year. I hope 2015 treated you well, and best wishes for the New Year! Now that the Amazon.com exclusivity period has expired, my second author-published short story is also available on iBooks, Kobo, Nook, and via direct sale. You can also find it still on Amazon.com. 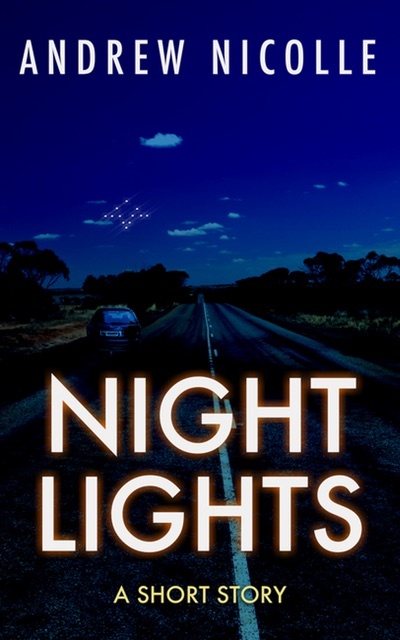 Amelia and Robert Burke are traveling along a lonely stretch of highway in the Australian Outback, in search of the mysterious Min Min lights. Their progress is halted by a blinding dust storm. Then Robert goes missing. 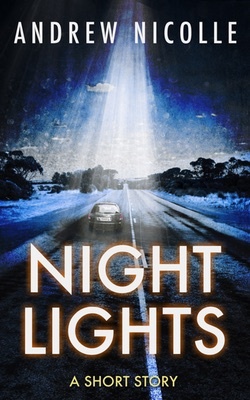 Trapped in their car and with little hope of survival, Amelia begins documenting their investigation and the horrors that lurk beyond the windscreen. 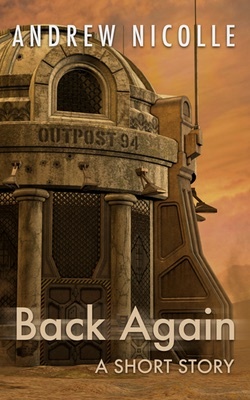 Night Lights joins my other recently author-published story, Back Again, which I talk more about in my earlier post. You might be wondering how the Amazon exclusivity worked out? Not so great, actually. It was enrolled in Kindle Unlimited (KU), where readers who signed up for a KU subscription could read it for free. The theory was that for short stories, the current economics of the program mean it’s possible to earn substantially more per download from a KU borrow ($1 or more) vs direct purchase at 99 cents (35 cents or so), provided the reader gets through more than 10% of the eBook. Well, there were zero borrows throughout the 3 month exclusivity period! The five free days had okay results, but those aren’t much of a drawcard since you can set the price to free on other eBook sites. I’m not precisely sure why readers were happy to download it for free on the free days, yet not borrow when it was in KU. I suspect it’s a combination of it being a short story (gotta get your money’s worth with novel borrows! ), visibility issues, and perhaps KU readers being a small percentage of the total pool of readers. I’m curious if anyone else has had better results with short horror enrolled in KU? I certainly won’t be trying the experiment again. Anyhow, I hope you enjoy the story, and look for more soon! My second author-published short story is now available exclusively on Amazon.com. Why the Amazon exclusivity, you may be asking? This is all part of the experiment. By making the story Amazon-exclusive, it’s not only available for sale, but also means it’s automatically enrolled in Kindle Unlimited (KU) . Readers who sign up for a KU subscription (currently $9.99 / month) get to read it for free. For short stories, the current economics of the program mean it’s possible to earn substantially more per download from a KU borrow ($1 or more) vs direct purchase at 99 cents (35 cents or so), provided the reader reads more than 10% of the eBook. It remains to be seen how long this will be true, but I’ll be watching how things go with interest. I’d also like to point out my initial cover design was greatly improved with the help from a reader on the kboards forums. Thanks, cagnes! My first author-published short story is now available on Amazon.com and for sale direct from my website. Tom Granger, a prisoner trapped in Kingsworth penitentiary, finds himself defending the prison against an alien invasion. I’ve been planning this publishing experiment for quite awhile now, but put things on the back burner to focus on apps this year. When I finally finished a flurry of app updates, I decided it was time to work on this project. To prepare, I watched some cover design video lectures from WMG Publishing and read the fantastic Zen of eBook Formatting by Guido Henkel. I also found a great stock illustration on Dreamtime to use as the basis for the cover. I used the Mac image-editing software Acorn to complete the cover design. This is all very much an experiment, but I’m planning to publish more of my stories in future. Meanwhile, I’m continuing to submit my work to publishers, as I have for much of the past decade. Look for another new short story soon in the next issue of Lovecraft eZine.